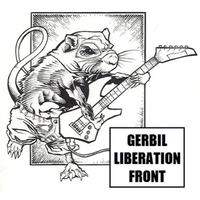 GLF was formed by a group of angry superhuman gerbils, whose high pitched hip hop and rowdy rodent metal has rocked audiences from coast to coast. Hits include "Chew", with a live action video with a gerbil driving a Ferrari like old school cat Toontzes. Nergil: rhythm guitar. Nergil is a very pissed off militant gerbil. He likes to turn the amp up to 11.